Social Artistry is a new model for leadership created by human potential leader, Dr. Jean Houston. Albert Einstein has been credited with pointing out that the same mindset that created a problem cannot solve it. Many of the problems in society today stem from leadership that is ill prepared to deal with the present complexity and chaos of modern life. Too many leaders have been educated for a different time, a different world and can only employ methods that have outworn their usefulness. Therefore, we need people with new and creative approaches to bring to community and organizations. 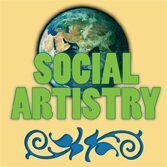 The work of Social Artistry enables the development of latent human capacities which lead to break thru when dealing with the challenges of present problems. Social Artists learn to develop the outer senses as known through the body as well as the inner senses of knowing and attuning to the highest level of inner experiences. It is dynamic and open-ended and provides a balance between the inner life and the work one is called to do in the world. As participants in the Building Creative Communities conference you are a person who is a social entrepreneur. You are probably recognizing this work as a call to create a world that works for everyone. How does one sustain the energy, motivation and creativity to do the hard work of community transformation? The Social Artist is taught skills and practices which are an antithesis to burn out. Social Artistry brings the focus, dedication, skill and vision of an artist to bear on the work that we are called to do in community.